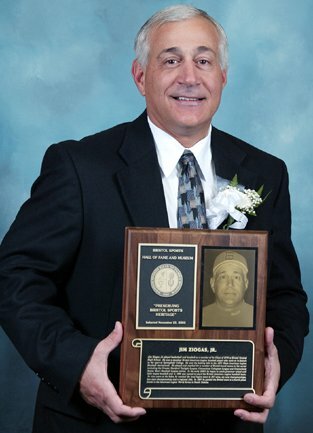 Jim Ziogas, Jr played basketball and baseball as a member of the Class of 1970 at Bristol Central High School. He was a standout Bristol American Legion baseball player who went on to feature in the sport at Springfield College. He won the batting title in 1971 State American Legion Baseball tournament. He played and coached for a number of Bristol-based teams in his career including the Greater Hartford Twilight League, Connecticut Collegiate League and Connecticut Senior Men’s Baseball League entries. In the early 1990’s he began to coach grammar school and little league baseball and in 1994 was named to coach the Bristol American Legion baseball team. In nine years at the helm, he coached the local legion team to 307 wins, six zone championships, two state championships and a regional title. In 1997 he guided the Bristol team to a fourth place finish in the American Legion World Series in South Dakota.